Pelle Gudmundsen-Holmgreen (b. 1932) is one of the leading Scandinavian composers, an outstanding and insistent voice from the generation born in the inter-war years. This CD is the culmination of the composer's unique collaboration with the world-famous American Kronos Quartet, which has been commissioning specially tailored works from the Danish composer for over 20 years. "I don't think I've heard the Kronos Quartet sounding better than this"
"Fearless performances are in evidence throughout"
Concerto Grosso (1990/2006) 29:45 22,40 kr. I Moving (Europe Seen in a Week) 12:25 12,80 kr. II Still (In Denmark I Was Born) 14:39 12,80 kr. Last Ground (2006) 10:10 12,80 kr. Pelle Gudmundsen-Holmgreen is one of the leading composers of the past century in the Nordic countries, a unique voice from the generation born in the inter-war years. In his early works Gudmundsen-Holmgreen's music took its cue from heroes like Bartók and Stravinsky. Around 1960 he embarked on a phase where he was influenced by post-war serialism. He renounced this path a few years later and instead became a pace-setter in the New Simplicity\\, as it was called in Denmark: laconic, simplified music which in Gudmundsen-Holmgreen's hands can become provocatively absurd. Often it exhibits a striking pessimism and black humour influenced by the Irish writer Samuel Beckett. Childlike wonder meets cynical comment, clichés meet originality, the ecstatic is united with the ascetic - Pelle Gudmundsen-Holmgreen's music is full of such clashes, never gathering any moss, often entertaining, always uncompromising. Moving Still - H.C. Andersen 200 is one of the works that were commissioned by the project Symphonic Fairytales for the celebrations of the Hans Christian Andersen bicentenary in 2005. Moving Still is in two movements: an American and a Danish one. The starting-point for this encounter is Hans Christian Andersen's little prescient text In a Thousand Years. This is a Jules Verne-like futuristic fantasy about how Americans will one day be able to fly over the Atlantic and \\do Europe in a week\\. Not a bad guess from Hans Christian Andersen - he only got the timescale wrong. Andersen's American vision has inspired Gudmundsen-Holmgreen to write a nervous, pulsating first movement with a nod to American minimalism. He emphasizes himself that the Americans Ives, Varèse, Cage and the minimalists from his own generation have had a crucial influence on him. And then too the Kronos Quartet is precisely an example of energetic Americans who come flying over for a series of splash-downs in Europe. In the American first movement the whole of Andersen's text is recited - in English. The accompaniment consists of a taped track where the soloist makes three layers of syncopated mouth music that reinforces the quartet's agitated pulsation and transport rhythms. Against this dynamic movement (\\Moving\\) stands an apparently static and thoroughly peaceful second movement (\\Still\\), a portrait of \\the Old World\\. Here Gudmundsen-Holmgreen uses Hans Christian Andersen's patriotic poem I Danmark er jeg født (In Denmark I Was Born) with ironic sophistication. The beautiful verses are Denmark's unofficial national song (many wish it was the official one), and over time the poem has used various melodies. The most common one today is the ascetic melody by the Carl Nielsen pupil Poul Schierbeck, but in the past a more romantic melody by Henrik Rung was used. Both have left their marks on the melody that Gudmundsen-Holm-green himself has written and uses in the second movement. \\My melody ends on a gently questioning rather than a bombastic note, thereby in a way putting a question mark after all of it,\\ says Gudmundsen-Holmgreen. But that is not all. An interlude in boogie-woogie style breaks the stasis, and gradually the melody begins to mutate in the direction of Arab music. The note D is the fixed point in Last Ground, and in the course of the piece the note A flat is kept out of the music until the very end, when the A flat sounds along with the D and forms the interval of the tritone. Even in the sea sounds that end the piece by flooding out the quartet completely. Concerto Grosso is one of Pelle Gudmundsen-Holmgreen's biggest works, both in size and status. In the work Gudmundsen-Holmgreen draws in several ways on the historical concerto grosso genre from the Baroque, where various instruments or instrument groups emerge from the crowd and play with and against the orchestra. In Pelle Gudmundsen-Holmgreen's Concerto Grosso there are many reminders of Baroque music, some used soberly, others as clichés. But there is certainly also much in the work that is not from the Baroque. In fact there is a lot in the music that is ‘baroque' in the original sense of the word - i.e. decidedly odd! \\Vivaldi on safari\\ is one of the composer's graphic descriptions of this meeting in the jungle between traditions and their -opposites. \\What I'm looking for is a filtering of the familiar. The familiar seen through a prism,\\ says Gudmundsen-Holmgreen. Concerto Grosso develops in one long stretch without pauses. The orchestra is expanded with a large selection of percussion, but on the other hand has had all its strings removed except for two double-basses. The orchestra is set up in a ring around the four quartet soloists, and parts of this surrounding ring enter into various configurations that are crucial to the development of the work. In the composer's own words his Concerto Grosso becomes \\a flow with a number of situations where the string quartet is set up against different soundscapes.\\ It forms a set of contrasting \\movements\\ in the long, unbroken sequence so that the work in fact takes on the character of another Baroque genre, the suite, with its kaleidoscopic array of rhythms and characters. 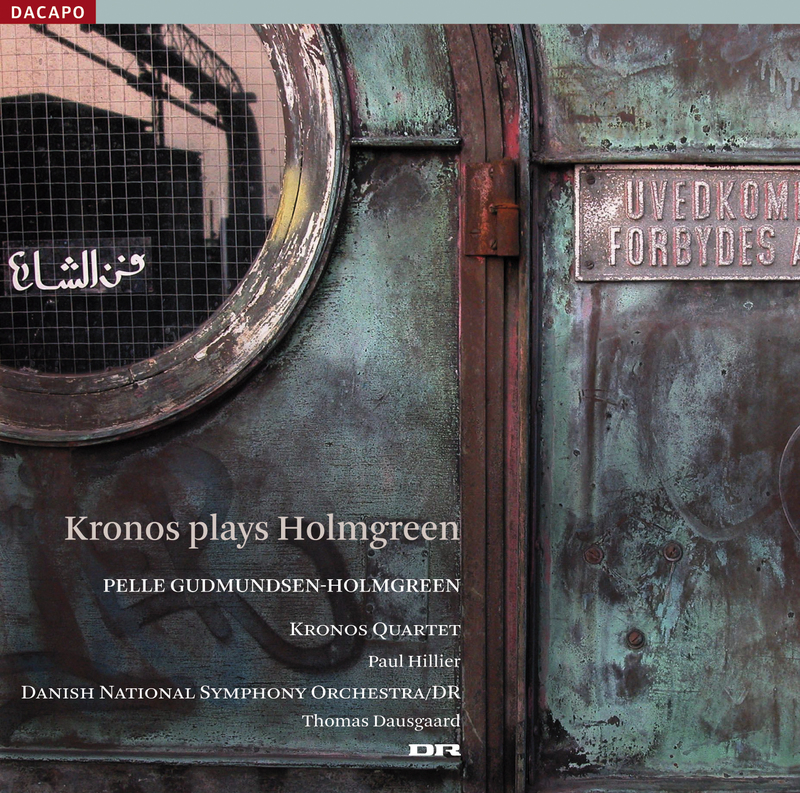 Pelle Gudmundsen-Holmgreen's Concerto Grosso was given its first performance in 1990 by the Kronos Quartet. In 1995 came the first revised version (recorded on Dacapo 8.224060). The version on this CD was made in 2006. Pelle Gudmundsen-Holmgreen zählt zu den führenden nordischen Komponisten des letzten Jahrhunderts; er ist eine einzigartige Stimme der zwischen den Weltkriegen geborenen Generation. In seinen Frühwerken orientierte sich Gudmundsen-Holmgreen an Helden wie Bartók und Strawinsky. Um 1960 begann eine vom Serialismus der Nachkriegszeit beeinflusste Phase. Diesen Weg verließ er jedoch wenige Jahre später und übernahm stattdessen eine tonangebende Rolle im Rahmen der „neuen Einfachheit\\, wie sie in Dänemark hieß, einer lakonischen und vereinfachten Musik, die unter Gudmundsen-Holmgreens Händen provozierend absurd sein kann. Oft zeichnet sich dabei unter dem Einfluss des irischen Dichters Samuel Beckett ein markanter schwarzer Galgenhumor ab. Kindliches Staunen trifft auf zynische Kommentare, Klischees treffen auf Originalität, Ekstase vereint sich mit Askese. Diese Art Zusammenprall findet man in Gudmundsen-Holmgreens Musik häufig. Nie bemoost, oft unterhaltsam, immer eigenwillig. Moving Still - H.C. Andersen 200 gehört zu den Werken, die vom Projekt Symphonic Fairytales zur Feier des 200. Geburtstags von Hans Christian Andersen im Jahr 2005 in Auftrag gegeben wurden. Moving Still hat zwei Sätze, einen amerikanischen und einen dänischen. Den Ausgangspunkt dieser Begegnung bildet Hans Christian Andersens kleiner vorausahnender Text Om Aartusinder (In Jahrtausenden). Dabei handelt es sich um eine an Jules Verne erinnernde Zukunftsphantasie, in der jeder Amerikaner einst über den Atlantik fliegen und „Europa in einer Woche\\ bereisen kann. Nicht schlecht geraten von Hans Christian Andersen - nur beim Zeithorizont irrte er sich. Andersens amerikanische Vision regte Gudmundsen-Holmgreen zu einem nervösen, pulsierenden ersten Satz an, der dem amerikanischen Minimalismus zuneigt. Er betont selbst, dass ihn die Amerikaner Ives, Varèse, Cage und die Minimalisten seiner eigenen Generation entscheidend beeinflusst hätten. So ist ja auch gerade das Kronos-Quartett ein Beispiel für energische Amerikaner, die angeflogen kommen, um schnell mal in Europa einzuschlagen. In dem amerikanischen ersten Satz wird der gesamte Andersentext auf Englisch rezitiert. Die Begleitung besteht aus einer Bandspur, auf der der Solist in drei Schichten synkopierte Mundmusik macht, die das heftige Pulsieren und die Transportrhythmen des Quartetts verstärkt. Diesem dynamischen Satz („Moving\\) steht ein scheinbar stillstehender und durch und durch friedlicher zweiter Satz („Still\\) gegenüber, ein Porträt „der alten Welt\\. Hier benutzt Gudmundsen-Holmgreen mit ironischem Raffinement Andersens Vaterlandsgedicht I Danmark er jeg født (In Dänemark bin ich geboren). Die schönen Verse sind Dänemarks inoffizielle Nationalhymne (viele Dänen hätten sie gern als offizielle), und das Gedicht wurde im Laufe der Zeit unterschiedlich vertont. Die heute bekannteste Fassung ist die asketische Melodie des Carl-Nielsen-Schülers Poul Schierbeck, während man früher eine romantischere Melodie von Henrik Rung benutzte. Beide haben in der von Gudmundsen-Holmgreen komponierten und im zweiten Satz verwendeten Melodie ihre Spuren hinterlassen. „Meine Melodie endet sanft fragend statt bombastisch, wodurch sie gewissermaßen das Ganze in Frage stellt\\, erklärt Gudmundsen-Holmgreen. Doch das hält nicht an. Ein Zwischenspiel im Boogie-Woogie-Stil bricht den Stillstand, die Musik mutiert allmählich in Richtung arabische Musik. Der Ton D ist der Fixpunkt von Last Ground, und der Ton As wird das Stück hindurch ganz aus der Musik herausgehalten, bis zuletzt, wo das As mit dem D zusammen klingt und das Intervall Tritonus bildet. Auch in den Meeresgeräuschen, die das Quartett am Ende des Stückes völlig überschwemmen. Concerto Grosso ist vom Umfang und Stellenwert her eines von Gudmundsen-Holmgreens größten Werken. Der Komponist lehnt sich darin auf unterschiedliche Weise an das historische Concerto-grosso-Genre der Barockzeit an, bei dem verschiedene Instrumente oder Instrumentengruppen aus der Menge hervortreten und mit dem Orchester zusammenspielen und ihm Gegenspiel bieten. Gudmundsen-Holmgreens Concerto Grosso zeigt viele Anklänge an Barockmusik, von denen einige nüchtern, andere als Klischees eingesetzt werden. Sehr viel in dem Werk stammt allerdings auch nicht aus dem Barock. Eigentlich hat die Musik selbst viel Barockes! „Vivaldi auf Safari\\, so beschreibt der Komponist anschaulich diese Dschungelbegegnung zwischen Traditionen und deren Gegensätzen. „Ich ziele auf ein Filtern des Bekannten ab. Das Bekannte durch ein Prisma gesehen\\, erklärt Gudmundsen-Holmgreen. Concerto Grosso verläuft langgestreckt ohne Pausen. Das Orchester wird durch eine große Auswahl an Schlagzeugen erweitert, dafür sind außer zwei Kontrabässen alle Streicher herausgenommen worden. Das Orchester ist im Kreis um die vier Quartettsolisten aufgestellt, und diese Umzingelung geht in verschiedene, für den Verlauf des Werkes entscheidende Verbindungen ein. Mit den Worten des Komponisten wird sein Concerto -Grosso zu „einem Flow mit einer Reihe von Situationen, in denen das Streichquartett unterschiedlichen Klanglandschaften gegenübergestellt wird.\\ Das bildet in dem langen, ungebrochenen Ablauf eine Reihe kontrastierender „Sätze\\, sodass das Werk praktisch den Charakter eines anderen Barockgenres annimmt, nämlich der Suite mit ihrer kaleidoskopischen Auswahl an Rhythmen und Charakteren. Gudmundsen-Holmgreens Concerto Grosso wurde 1990 vom Kronos-Quartett uraufgeführt. Die erste überarbeitete Fassung kam 1995 (Dacapo 8.224060). Die vorliegende Ausgabe entstand 2006. Dacapo Records acknowledges, with gratitude, the financial support of Beckett-Fonden, Oticon Foundation, the Danish Composers' Society/KODA's Fund for Social and Cultural Purposes and KODA's Collective Blank Tape Remuneration. Kronos Quartet appears courtesy of Nonesuch Records. This CD has been recorded in cooperation with the Danish Broadcasting Corporation.